ASSOCIATION OF NEW JERSEY RIFLE & PISTOL CLUBS, INC. The Association believes that the safest firearm is one that is being handled by a safety conscious sportsman. We are working hard to insure that shooters understand the critical role they play in protecting the safety of themselves and those around them. The Association of New Jersey Rifle & Pistol Clubs Inc. was founded in 1934 to help protect the rights of gun owners and sportsman throughout the state of New Jersey. The Cherry Ridge Range is the flagship range of the ANJRPC. By joining the Cherry Ridge Range and ANJRPC, you are helping to continue the traditions started by those early members, and help preserve our Second Amendment rights. The Range Safety Rules are designed to make our range as safe as possible and to safely and conveniently accommodate as many of our range members as possible at any given time. The Range Manager is present at all times, and a Range Officer is present whenever the range is open to the shooting membership. As part of your membership, every other month you will receive a copy of our newsletter News and Briefs, in which you will find a list of all matches. The range on which the match is being held will be closed for that day (or as otherwise specified; all times are approximate) Current work projects may also require the closing of one or more of the ranges, please call the RANGE AVAILABILITY HOTLINE at (973) 764-1333 before you come to shoot. The ANJRPC Inc. is not responsible for enforcing either state or federal firearms laws. We recommend that you do not bring any illegal firearms or illegal firearm components to the Cherry Ridge Range. We urge any members with questions about these laws to contact their attorney, or one of the attorneys retained by ANJRPC for this purpose. The latter are listed in each issue of our newsletter News & Briefs. Certain restrictive New Jersey gun laws provide exemptions for transportation to and from a recognized rifle and pistol club range. One law allows temporary firearm transfer of possession at a range such as Cherry Ridge, which submits the names of its members (without addresses or telephone numbers) annually to the State Police. The Cherry Ridge Range opens at 8:30 am. Closing times are seasonal. (approximately 1 hour before sunset) Please call the Range Availability Hotline, or ask a Range Officer for exact closing time. All vehicles must be off range property by sundown. With the exception of organized tournaments and special club events, the use of the range is restricted to members holding a range privileges membership and their authorized guests. The loan of a range privilege pass or membership card is prohibited. All junior members must be supervised by an adult member with full range privileges at all times. Pets and children must be supervised by an adult, and are not permitted to run free. Once you receive your range privileges pass you may go directly to the range on which you wish to shoot. The range clubhouse is open for your use. The code for the door can be found on your wallet membership card. Please leave the clubhouse as you found it. General firearms supplies, cleaning supplies, safety flags, firearm cases, paper targets/ Clay birds, guest passes. Rental of clay bird throwers, target frames, five stand keys. There is no smoking within 20 feet of any firing line, high-power pits and inside the club house building. Hunting and fishing is not permitted anywhere on ANJRPC property. No alcoholic beverages are permitted on ANJRPC property at any time. Vandalism will not be tolerated! ANJRPC property is monitored by a closed circuit TV system. Anyone found vandalizing ANJRPC property will be held liable for the cost of damages and can lose their membership. All litter should be removed from the range by the member. All spent shells casings must be picked up. Spent shells casings can be taken home with you for recycling or reloading. ANJRPC has provided brass recycling barrels if you do not wish to take your brass home. Any live ammunition MUST be taken home. Please do not put any live ammunition in the brass barrels or garbage. Range Officers will monitor the weather and determine when the range is to re-open. SHOULD BE REPORTED TO THE RANGE OFFICERS IMMEDIATELY!!! No fully automatic firearms are permitted. The use of firearms not designed to be fired from the hand or shoulder is not permitted. No firearms are allowed in which the action cannot be locked open. Only muzzleloaders are accepted. The use of tracer, incendiary, or armor piercing ammunition is prohibited. The Range Officers have the authority to enforce these safety rules and regulations, and assist members when necessary. Abusive or profane language directed at any range personnel will result in a review of your suitability for membership. Any & all commands given by Range Officers and range personnel must be obeyed immediately and without question. Range Officers and range personnel reserve the right to inspect any firearms or ammunition for safety considerations. The wearing of hearing protection and safety glasses is mandatory for all shooters and anyone standing along the firing line. Firearms may only be handled when the firing line is ready or “Hot” (this is when firing is permitted). NEVER handle a firearm when the firing line is not ready or “safe”. No one is allowed to carry a firearm anywhere on range property with the following exception. Law enforcement personnel that are on duty and in uniform or displaying credentials. Firearms that are not being handled or that are unattended must either be cased or have a safety flag installed in the chamber. (NOT in the end of the barrel). The safety flag must be the type sold by the NRA and/or CMP or of substantially similar design. A substantially similar safety flag is one that meets all of the following criteria. It must extend into the chamber of the firearm. It must have a flag that extends out of the chamber of the firearm and blocks its function. In the absence of a proper chamber flag, an unattended firearm on the firing line must be unloaded and placed back in its case. If you handle a firearm after the range has been made safe or “cold” or do not have a safety flag installed in the chamber of the firearm, you will be told to leave the range for the day. Remember to treat every firearm as if it were loaded. Any and all rapid fire is to be done in a controlled manner. All rounds fired must hit your target AND the impact berm beyond. (you are responsible for the entire flight of your bullet). If any rounds miss the berm or leave the range you may be asked to please slow your rate of fire. If the shooter holds a NRA or USAS Pistol classification card, and is practicing for, or shooting in a “bullseye” pistol match. The muzzle of all firearms (even if safety flag is installed) must be kept pointed down range at all times. Before any shooters proceed forward of the firing line, the line must be made “safe” (See PROCEDURES FOR CALLING THE LINE “SAFE” OR “HOT”). If no safety flag is available, you must unload and place the firearm in its case. Do not approach your bench when the firing line has been made “safe”. Please take anything you need for the target change off of your bench and place it behind the yellow line before the line is made safe. For ranges with no yellow line please remain a minimum of 5 feet behind your bench. The firing line will remain “safe” until all shooters have returned from down range and are behind the yellow line or 5 feet behind the shooting benches. When transporting a firearm to and from a firing bench, it must be unloaded and in a gun case. Firearms should be loaded on the firing line only (except for muzzleloaders). Firearms must remain in their gun case if the range is “safe”. Do not move your cased and unloaded firearm past the yellow line or closer than 5 feet to the benches if the firing line is “safe”. When the firing line is “hot” you may take your firearm to the bench, un-case it pointing down range and install the safety flag. You should then prepare to set your target on the next ceasefire. You must place a target down range before you may shoot. Target must be the proper type for the range you are shooting on. See SAFETY RULES FOR INDIVIDUAL SHOOTING RANGES for proper target types. Silhouette type target and photo realistic targets are permitted, provided they do not depict any readily recognizable person alive or dead. No more than one target frame should be placed per firing port on the 100 Yard, Handgun, and Multipurpose Ranges. o Target frame must be placed directly in front of your firing port. o Targets MUST be placed on your frame so that all rounds hit the target and the berm beyond. o If any rounds are observed to not hit the berm or are impacting in a non-impact area, you may be asked to stop shooting and adjust your target on the next ceasefire. o If using a movable target stand, i.e. sled, it must be placed directly in front of your shooting port. o Only one person per port is permitted to shoot at a time. Any firing at cans, bottles, wildlife, rocks, vegetation or any other improper target is strictly prohibited. Target changes are usually done on the hour and half hour. Let the shooters finish their strings, unload and make safe their firearms (safety flags installed, magazines removed, or firearms cased). Wait for all shooters to step behind the yellow line, or 5 feet behind the benches. All persons on the firing line need to move behind the yellow line or 5 feet behind the benches and may not approach the firing benches until the line is “Hot”. Ask “Safe on the right? Safe on the left?” and visually verify all are safe. Announce “range is going cold”. Turn on red warning lights (100 Yard, Handgun, and Shotgun Ranges) wait for the buzzer to sound before moving forward of the firing line. Ensure that all shooters have returned from down range, and are standing behind the yellow line, or 5 feet behind the benches. Ask “ready on the right, ready on the left” and visually verify all are ready. Announce “range is going hot”. Turn off the red warning lights (100 Yard, Handgun, and Shotgun Ranges). You may now resume firing. Range is for shooting at paper targets on a standard frame only. No movable target stands or sleds may be used on the range. Standard distances are 50 yards, 50 meters and 100 yards. Ports 1-5 are for black power shooting. Ports 40-50 are for rim fire only when the range is not so busy as to have people waiting to shoot. If the range is busy and the ports are filled, infill is permitted by larger calibers into the rim fire ports. Handguns may be used on the 100 yard range under all of the following conditions. They must be of an approved caliber. Member be pre-approved and must demonstrate to Range Manager or Chief Range Officer your ability to hit the target and impact berm. Member will be given an exemption form that must be with you when shooting the handgun. Shooting positions may be limited on the exemption form. Red warning lights must be used any time anyone is going forward of the firing line. (See PROCEDURES FOR CALLING THE LINE “SAFE” OR “HOT”). Movable target sleds are available for distances closer than 25 yards. Standard distances are 25 yards, and 50 yards however moveable sleds permit shooting at closer distances. NEVER remove a handgun from its case at the seating benches (Behind the yellow line) for any reason. When loading or handling a handgun ALWAYS keep it pointed down range. NEVER point it to the sides or down at the ground. Junior members under the age of 12 may not shoot a handgun. Junior members between the ages of 12 and 21 will be permitted to shoot a handgun, if they meet one of the following conditions. If they are accompanied by a Certified NRA Pistol Instructor. Instructor may be asked to show certification. Instructor must be a Member with full range privileges. Instructor is to insure that all Cherry Ridge Range Safety rules are followed. The instructor must be at the firing bench at all times junior member is firing or handling a handgun. They have completed the Junior Handgun Safety Course given on the first Sunday of the month and can show proof of successful completion. They must be supervised by an adult member with full range privileges, who has also completed the Junior Handgun Safety Course. The adult member must be at the firing bench at all times junior member is firing or handling a pistol. There is to be no drawing of guns from holster except for retired or active police displaying identification while practicing for a PPC match or qualification and they must check in with range officer. The last 5 positions to the right side of range are for black powder shooting only. The shooting schedule for the 2 firing lines is as follows. 1:00 pm to closing at the 300 yard line except on Wednesdays when the 300 yard line shoots 8:30 am to 1:00 pm. Shooting may continue on the 200 yard line after 1:00pm as long as no other member wants to use the 300 yard line. Range is for shooting paper targets only. Single paper targets with one aim point. Paper targets with multiple aim points that are less than 12" x 12"
All targets must be CENTERED on the frames. Standard distances are 200 yards and 300 yards. Members may use multiple target frames as long as the range is not full. If any member is to remain in the pits to score and operate targets, they MUST have two way radio communications with the firing line. Cell phones ARE NOT to be used in place of radios. It is not permitted to exit the pits under any circumstance while the firing line is “hot”. When the firing line is “hot” the yellow gate must be placed across the road leading to the pits. Handguns may be fired from the 200 yard line under all of the following conditions. Member must be pre-approved and must demonstrate to Range Manager or Chief Range Officer your ability to hit the target and impact berm. Member will be given an exemption form that must be carried when shooting the handgun. Firearm must have a minimum barrel length of 8 inches. Firearm must be in an approved caliber. In-line muzzleloaders may be fired from the 200 yard line. 50 caliber BMG can be fired from the 300 yard line, between the hours of 1:00 pm to 1 hour before closing on Thursdays and the first Saturday of the month only. All shooters must check in with the Range Officer BEFORE going to the firing line. All ammunition must be checked by a Range Officer before shooting. No steel core, armor piercing, or tracer rounds are permitted. Shooting is to be done on ports designated by the range officer on the 300 yard line. Shooters must be able to put ALL rounds in the impact berm. Rifle is to be zeroed at or near 300 yards. Due to possible fire danger, 50 caliber shooting schedule maybe canceled if dry weather conditions persist. Please call the Cherry Ridge Range Hotline for information before you come to shoot. 1. Red warning lights must be used any time anyone is going forward of the firing line. (See PROCEDURES FOR CALLING THE LINE “SAFE” OR “HOT”). The shotgun range is to be used for shooting at aerial targets and patterning on paper targets. Only biodegradable clay targets are permitted. Slugs and buckshot ARE NOT allowed to be fired on this range. The use of shot size larger than 7 ½ bird shot is not allowed for aerial shooting. Members may bring their own thrower which must be clamped to a bench or on the ground behind the firing line. The Five Stand automatic throwers may be used by any member with range privileges and their guests. Keys are available at the ANJRPC Foundation store. Key must be returned to the store no later than 5:00pm unless purchasing a count up key. Members may use any of the tables on the firing line with the following exceptions. Five Stand customers have priority at Five Stand tables. A member must relinquish a Five Stand table to the Five Stand customers, even if there are no other tables available. If there is more than one Five Stand customer, a reasonable rotation schedule should be established. Member must remove any empty cardboard boxes and empty shot shells from the range. ONLY .22 Long Rifle Rim Fire ammunition (1500 fps or below) is allowed to be fired on this range. Any paper targets placed on standard frame. Any metallic type targets rated for .22 Cal bullets or larger. Movable target sleds are available for distances closer than 50 yards. No metallic targets may be placed closer than 15 yards to the shooter. All rounds fired must impact in the berm at 50 yards, or inside one of the steel backstops. Only black powder or black powder substitutes may be used. Firing is to be done in the following ports and ranges only. First 5 ports on the left side of the 100 Yard Range. First 5 ports on the right side of the Handgun Range. On the 200/300 Yard Range (see SAFETY RULES FOR THE 200/300 YARD RANGE, Rule 8. All loading is to be done from pre-measured loads. Pre-measured self-contained loads may only be used on the firing line. All capping and priming is to be done on the firing line. No duplex loads are to be used in muzzleloaders. Flint locks must use a flash shield on the flash pan. All powder horns and powder cans must be kept closed and on the loading bench. No smoking within 8’ of black power. No black powder may be brought into the club house. When target changes are requested, any muzzleloader not in the firing process. Placed in the rifle rack with its muzzle pointing up. If a muzzleloader is fouled and cannot be cleared, it must be flooded with water before leaving the range. Contact a Range Officer for assistance. The firing line must be made “safe” before anyone retrieves their arrows. All crossbows must be discharged before anyone moves forward of the firing line. All arrows and bolts must be un-nocked. Members may also place their own archery rated targets. Please remove them from the range when you are finished. NO BROAD HEADS are allowed, field points ONLY. Your guest is your responsibility! Guests under the age of 12 may not handle or fire a handgun. Member and all guests must use the same shooting port. The member risks losing range privileges for a period of time up to and including loss of membership, depending on the severity of the violation. PLEASE REMEMBER THAT IF ANY GUEST IS OBSERVED SHOOTING UNATTENDED, OR VIOLATES ANY OF THE RANGE SAFETY RULES, MEMBER AND GUEST RISK LOSING RANGE PRIVILEGES FOR THE DAY OR LONGER. THERE CAN ALSO BE ADDITIONAL CONSEQUENCES DEPENDING ON THE SEVERITY OF THE INFRACTION. PLEASE BE AWARE THAT ANY VIOLATION OF THE CHERRY RIDGE RANGE SAFETY RULES MAY RESULT IN MEMBER BEING ASKED TO LEAVE THE RANGE FOR THE DAY, SUSPENSION OF RANGE PRIVILEGES FOR AN EXTENDED PERIOD OF TIME, OR LOSS OF RANGE MEMBERSHIP DEPENDING ON THE SEVERITY OR FREQUENCY OF THE VIOLATION. The diagram below is a variation of the target frame that must be used on the following ranges. 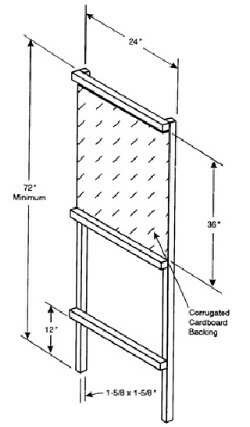 The backer (area targets are attached to) must be a non-metallic, non-splintering material. The ANJRPC currently offers a folding leg version of this frame at a reasonable price.